A viral video shows a Zomato employee helping himself to a customer's meal. 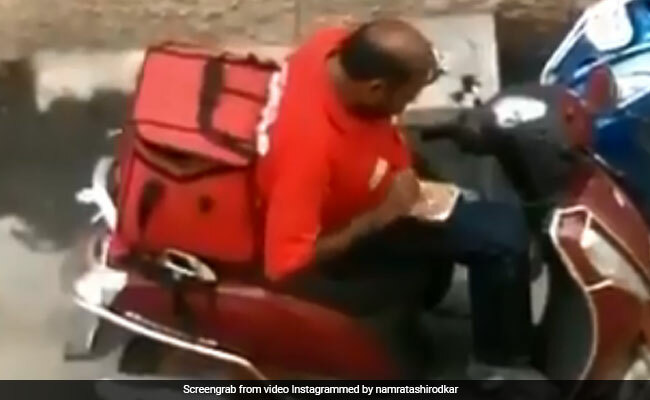 Actress Namrata Shirodkar was amongst the many netizens who reacted angrily to a viral video which shows a Zomato delivery executive taking a bite out of a customer's meal. The video, which emerged and went viral on Monday, appears to show an employee of the restaurant search and food delivery platform helping himself to a bit of a customer's meal before re-sealing the boxed order and putting it back - likely to be delivered. The video prompted widespread outrage on social media, and actress Namrata Shirodkar was amongst the many who reacted to it. Sharing the video on Instagram, the Pukar actress wrote: "It's really shocking how these reputed food delivery companies are functioning. People order food online expecting basic hygiene and this is how it is delivered?!!?!" She continued: "What about the work ethics of these delivery boys?? Looks like its time to think twice before opening that app & placing the order. I am definitely not gonna encourage my kids to order food online, I suggest even you guys don't!" Since being shared online only a couple of hours ago, the video has been viewed over 60,000 times and has received a lot of support. Other versions of the video, posted on Twitter, have together collected more than 2 lakh views since yesterday. About 16 hours ago, Zomato responded to the incident and formally acknowledged the flaw as a "human error in judgment." They also revealed that the video had been shot in Madurai, and the delivery executive had been taken off their platform. We take food tampering very seriously. "We take this very seriously and will soon introduce tamper-proof tapes, and other precautionary measures to ensure we add an extra layer of safeguard against such behaviour," they said in their statement.